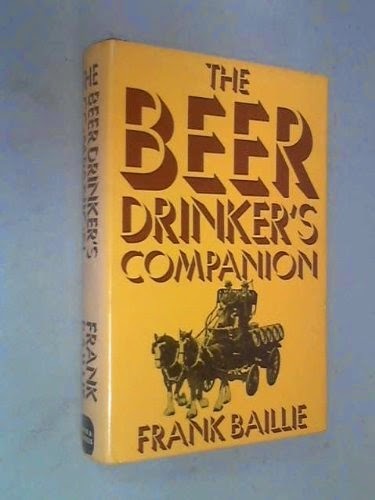 I've just picked up a second-hand copy of The Beer Drinker's Companion, Frank Baillie's 1974 survey of British beer and brewing. I was inspired to look out for it by a reading list on Boak and Bailey's blog as it was pretty much the only book there that I hadn't got. Some of the things he mentions about the storing and serving of beer ( (metal v wooden casks, gravity or hand-pumps v electric dispense, cellar conditioning v bright, top pressure or container tank beer) aren't really issues now; others, like serving temperature and cloudiness, clearly still are. One of the things that stands out is bottled beer. Bottle-conditioned beers are now, he says, "very few" (Guinness Extra Stout and Worthington White Shield being the only nationally available ones), compared to the hundreds you can buy today. On the other hand, the number of bottled beers in pubs has dropped. In 1974, according to Baillie, my local brewery, Robinsons in Stockport, produced not only the bottled pale and strong ale they still sell but also a bottled stout and a light and a brown ale. I think this has to do with the decline in mixing bottled and draught beer that I remember from my early pub-going days in the late 80's. Seeing the twenty-two year old midfielder Mario Götze come on as a substitute and score the winning goal for Germany in extra time in the World Cup Final last night reminded me of Brian Kidd's goal for Manchester United on his nineteenth birthday in the 1968 European Cup Final at Wembley. 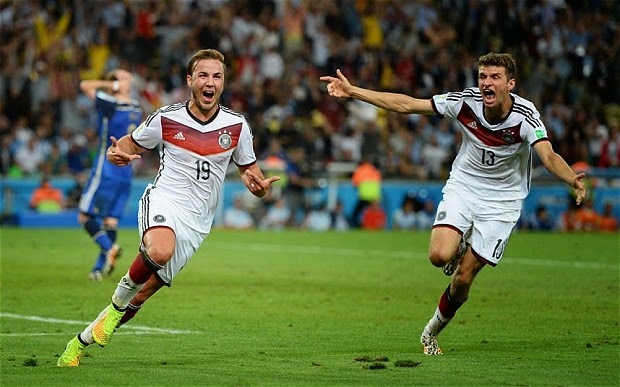 Where do you go next in your career when the highlight comes so near the start of it? "one of those men who reach such an acute limited excellence at twenty-one that everything afterward savours of anti-climax...Tom would drift on forever seeking, a little wistfully, for the dramatic turbulence of some irrevocable football game." Last night's edition of the Channel 4 documentary series Dispatches, which claimed to investigate the influence of the drinks industry on Government policy, was really a propaganda piece for "minimum unit pricing" alcohol. The beer I drink in pubs and at home is already above the suggested minimum unit price of 50p so a change along those lines isn't going to affect me but I still came away thinking that the arguments the programme put forward are seriously muddled. How can we stop young people "pre-loading" unsupervised at home with cheap alcohol bought in supermarkets and off-licences before heading out to pricier pubs and clubs? Increase the cost of the alcohol supermarkets and off-licences sell of course, argued Dispatches. But that defeats the object of "pre-loading" doesn't it? And for those who think that it will force them to go straight to the pricier, supervised pub, they won't: unless minimum pricing is European-wide, they'll either buy cheap alcohol from people who've smuggled it in from the Continent or, especially if they live in the South of England, pop across the Channel for it themselves. This point seemed to elude the coffee-drinking professor in Canada who claimed that minimum unit pricing there had cut hospital admissions and arrests for assault. And what about the underage drinkers who get their older mates to buy drink for them from supermarkets and off-licences? They won't even be able to get into pubs and clubs and will be forced to deal with unlicensed vendors. 1. Introduce rationing via an electronic ID card, allowing you to buy so many units a day/week/month. Admittedly a little authoritarian, and also vulnerable to cross-border smuggling, it would at least mean that cheap alcohol was still available to "responsible drinkers", as long as the Government didn't use the current, ridiculously low, recommended units. 2. Require all sellers of alcohol to permit drinking on the premises, provide seating and glasses etc. Let's see how much cheap booze Tesco sell when they have to employ bouncers to turf out the teenagers and alcoholics at closing time every Friday and Saturday night.